Have you ever heard the saying "Do one thing every day that scares you?". The idea is to keep pushing and challenging yourself to try new things. I have to admit, I was a little scared on my first visit to Northside Boxing in Nundah. With the theme song from Rocky playing in my head, I pumped myself up and went on in only to be pleasantly surprised. Northside Boxing is an old school, no frills, down and dirty boxing gym. 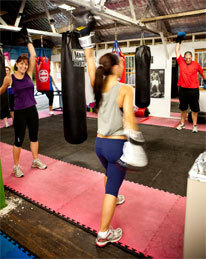 But while the boxing is tough, the trainers are actually really nice, encouraging and even funny. Having great trainers makes a heart pounding, sweat pouring session so much more rewarding. We've all seen boot camp style sessions where the trainer is screaming at you - you won't get that here. The trainers are going to push you but they are far more interested in motivating you to feel fitter, stronger, and faster than raising their voice. And for a woman, that makes all the difference, especially when you are in a boxing ring for the first time. Photo courtesy of Northside Boxing Website. Northside Boxing offers both group fitness and personal training programs under the guidance of owner Jojo Tipace. I opted to start with a personal training session, so that I could learn a bit of technique and get more comfortable with my own ability before joining a group session. If you have never boxed before, I would highly recommend starting with a personal session just so you get to learn the ropes (geez, sorry I couldn't resist the bad joke!). No membership fees- you only pay for the sessions you need and aren't locked into any contracts. Excellent Value- group sessions are from $15 per class and personal training sessions start from $50 (they even offer multi-session discounts). Easy location- walking distance from Northgate and Nundah train stations with plenty of free on-site and street parking. Great atmosphere- Northside Boxing looks, feel and smells like a boxing gym. You're not there to check out the latest gym gadgets or admire the Lorna Jane gym fashion- you're there to work. I have already signed up for more sessions and can't wait to test myself in an upcoming group session! Northside Boxing is located at 67 Robinson Rd, Nundah or visit their website for more information.